A cloth-finisher or -cleaner. The Hebrew term is (Mal. iii. 2) or (II Kings xviii. 17; Isa. vii. 3, xxxvi. 3), denoting one engaged in either of two occupations: (1) the cleaning of soiled garments or cloth, and (2) the finishing of newly woven cloth. 1. The cleansing of cloth or garments may have developed into a distinct trade at an early time, as the operation involved too much work and consumed too much time (for colored materials one day; for white garments three days) to be done at home. The soiled garments were soaked in water to which various soapy, corrosive substances (such as alkaline salts) were added. Then they were stamped with the feet or beaten with wooden billets. This work is referred to in Mal. iii. 2 and Mark ix. 3, where the term might be rendered "washer." 2. In order to remove the fatty particles adhering to newly woven cloth, and especially the matted wool entangled therein, and to give the fabric firmness and proper texture, it was steeped in hot water and then stamped and worked over with the fulling-billet. The cloth had to be scraped repeatedly during the process, and the wool evenly trimmed off. On account of the offensive smells attending the business, the fullers' shops were located outside of the city in the vicinity of large ponds or springs, where the water-supply was abundant, the cisterns within the city being reserved for domestic use. 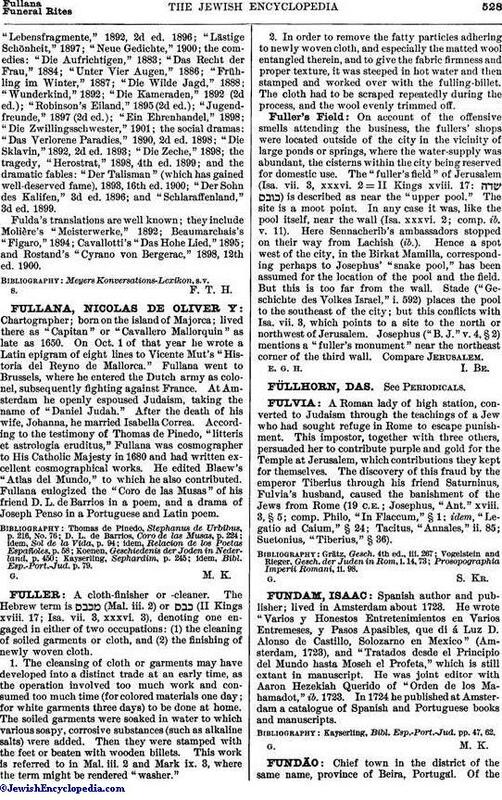 The "fuller's field" of Jerusalem (Isa. vii. 3, xxxvi. 2 = II Kings xviii. 17: ) is described as near the "upper pool." The site is a moot point. In any case it was, like the pool itself, near the wall (Isa. xxxvi. 2; comp. ib. v. 11). Here Sennacherib's ambassadors stopped on their way from Lachish (ib.). Hence a spot west of the city, in the Birkat Mamilla, corresponding perhaps to Josephus' "snake pool," has been assumed for the location of the pool and the field. But this is too far from the wall. Stade ("Geschichte des Volkes Israel," i. 592) places the pool to the southeast of the city; but this conflicts with Isa. vii. 3, which points to a site to the north or northwest of Jerusalem. Josephus ("B. J." v. 4, § 2) mentions a "fuller's monument" near the northeast corner of the third wall. Compare Jerusalem.